Office shelving from Erect-A-Rack provides office shelving in workplaces that are experiencing storage problems, helping to transform an office into an efficient and effective workplace. Erect-A-Rack office storage provides additional space to work, resulting in happier workers and a tidy and organised office. It can be fully customised to meet specific customer applications and will offer an effective and professional appearance. Erect-A-Rack’s office storage solutions include a range of shelving including Ezi-Glide systems and Rolled Upright Type shelving. Ezi-Glide shelving is simple to install and is strong and durable. 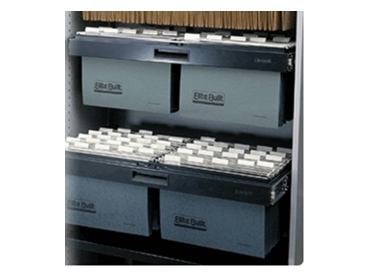 It is ideal for use in office buildings and warehouses for the storage of documents or even parts bins. Rolled Upright Type (RUT) shelving is available as single and double sided and can be used as the basis for the mobile storage shelving range. This enables static shelving to be converted into a mobile shelving if necessary.